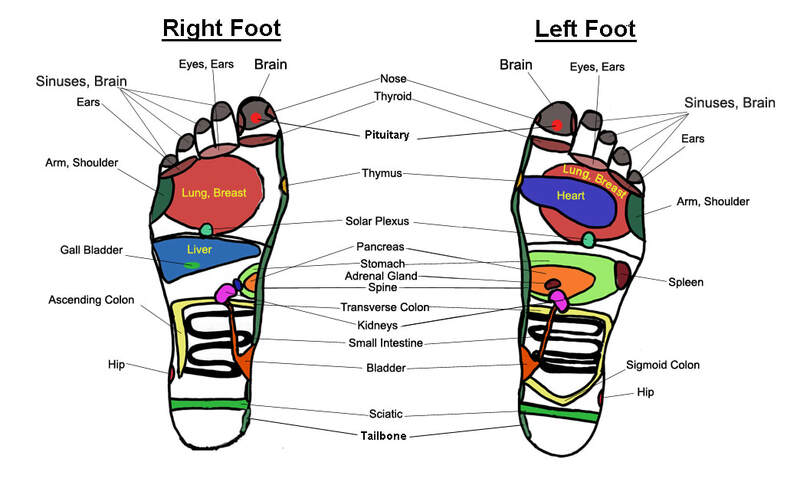 This is a combination of foot reflexology and aromatherapy! It combines the use of hydrosols and essential oils together with traditional foot reflexology. Reflexology involves pressing on and massaging different parts of the feet which correspond to different areas and organs of the body. By working those points on the feet, it's possible to provide relief to those parts of the body. Aromatic Reflex Therapy adds an extra dimension. After I have assessed any blockages or areas of pain in your feet, I will blend essential oils known to help with those areas and apply them to the points on your feet as well as use them to massage your feet at the end of the treatment. You can expect a similar process as I use with aromatherapy massage in terms of a holistic model, discussion about your medical background, health goals and any special needs. Generally speaking, foot reflexology is safe for most people and can be extremely effective for those who either don't enjoy or cannot receive massage. Some things this treatment can help with are general stress, anxiety, difficulty sleeping, IBS (irritable bowel syndrome) constipation, clearing blocked sinuses and tension headaches. If you are a person who generally does not like to have their feet touched - don't rule this out! I've worked with many people who hated having their feet touched but discovered that they loved aromatic foot reflex therapy! ​First-time clients should contact me to discuss setting up an appointment. Established clients can use the online booking system by clicking the button below. Don't forget to check out our pricing system here!